The reggaeton star was arrested on charges of failing to declare transportation of monetary instruments in excess of $10,000 and bulk cash smuggling into the U.S. In this file photo, Farruko speaks at the Billboard Latin Conference 2017 at Ritz Carlton South Beach on April 26, 2017 in Miami Beach, Florida. Puerto Rican singer Farruko was accused on Wednesday of hiding nearly $52,000 in undeclared cash in his luggage and his shoes when he arrived in the U.S. territory via helicopter from a trip to the Dominican Republic. The U.S. Attorney's Office said the singer, whose name is Carlos Efren Reyes, was arrested on charges of failing to declare transportation of monetary instruments in excess of $10,000 and bulk cash smuggling into the United States. 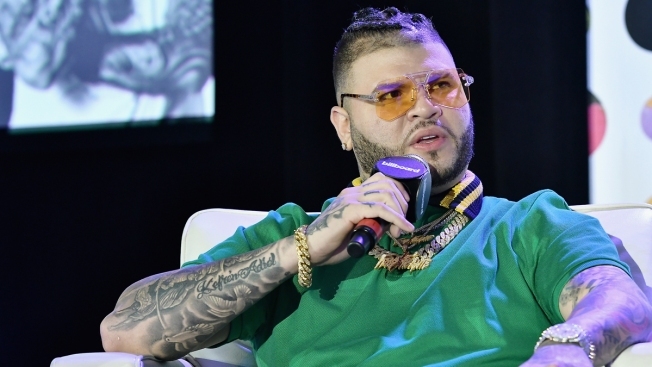 Farruko was initially detained on Monday at the Isla Grande airport when agents searched his bags and found the money after he declared he was not carrying more than $10,000, said U.S. Attorney Rosa Emilia Rodriguez. Then a judge on Tuesday issued an arrest warrant, and he was detained that evening at his parents' house in the northern city of Bayamon, Ivan Ortiz, a spokesman for U.S. Customs and Immigration Enforcement, told The Associated Press. Farruko was being held without bond and was scheduled to appear in court Wednesday afternoon. If found guilty, he could face a maximum fine of $250,000 or up to five years in prison, or both. Officials at Carbon Fiber Music, an entertainment company that represents the singer, did not return messages for comment. Farruko is a well-known reggaeton and trap singer who in 2012 was nominated for the Latin Grammy Award for Best Urban Music Album. He has an upcoming international tour that starts April 19 in Mexico City and ends in Los Angeles on June 30.